In today’s message, I am directing my arguments to small employers who use pen and paper timesheets. How often do you worry about labor law compliance? I’m talking about FLSA laws that govern minimum wage, child labor, and overtime pay. There are also ACA standards that apply to business owners with over 50 full-time equivalent workers. Other standards that affect employers are embodied in OSHA, COBRA, Title VII, and ADA. Wow! That’s a lot of laws for business owners to comply with. However, for today’s post, we will concern ourselves with FLSA and ACA compliance. My intent is to convince you that using an outdated or ineffective employee time and attendance system puts you in danger of being fined for noncompliance. And make no mistake: being fined for a DOL violation can completely put you out of business. To comply with standards that govern employee wages and hours, you first have to know exactly how many hours your associates are working. If your time and attendance system does not collect accurate records, any other attempts at compliance are moot. Accurate records are your most important layer of protection. So far I have just explained honest foul-ups. These could cause you to pay more or less on a paycheck depending on which way the error falls. There is another threat to time card accuracy and it always causes you to pay more in labor: deliberate employee time theft. When workers deliberately record more time than they actually work, you are not only on sketchy FLSA grounds, you unnecessarily pay more for labor. I have addressed time theft in many other posts, so I won’t say any more about it in this article. Back to the compliance implications. Suppose you are an employer with 10 part-time and 48 full-time equivalent employees. Since you don’t have 50 full-time equivalent staff members, you are not subject to some of the provisions in the Affordable Care Act. You hire a couple more part-timers. The ACA defines full-time as 30 hours per week on average or 130 hours per month. 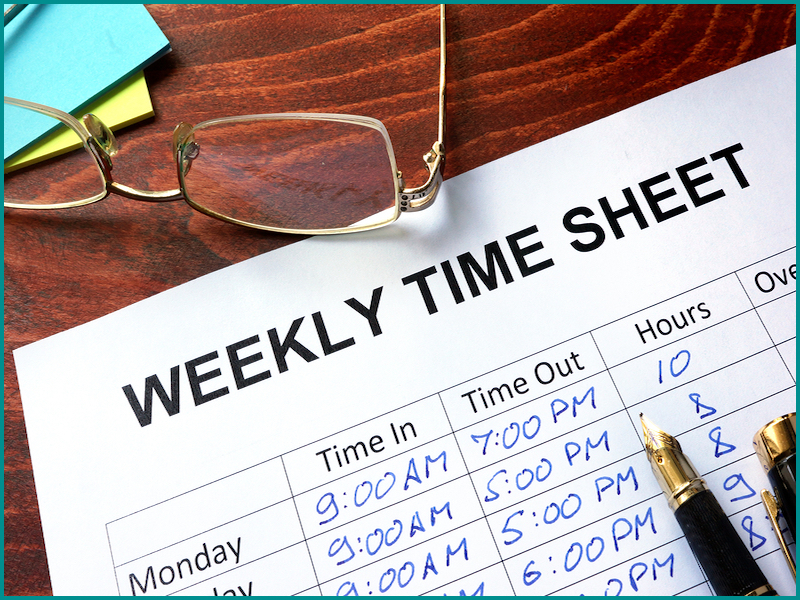 Suppose the two part-timers you hire are authorized to work 28 hours per week. But say the manager over them is too busy to pay much attention to exactly how many hours and minutes these two employees work each shift. You have an unusually busy couple of weeks and everyone is in “all hands on deck” mode. These two part-timers record more than 30 hours per week. It doesn’t matter if they actually work that many hours or if they intentionally exaggerate hours, either way, you now have 50 full-time equivalent workers according to the ACA. That is just one example. A similar scenario could put you at risk of overtime noncompliance. Suppose one of your non-exempt employees adds two overtime hours he or she didn’t actually work on a few time cards. But no one notices this seemingly trivial aberration of the employees’ usual forty hour per week schedule. A couple months later, the employee realizes that he or she was due overtime and files a complaint with the Department of Labor. If the can prove he or she worked overtime and you can’t prove otherwise, you will be fined. Labor law compliance can be complicated, but employee time and attendance doesn’t have to be. TimeSource Plus from Access1Source used with a biometric time clock ensures accurate tracking of employee time and attendance. Call 480.784.4440 to schedule a no-pressure demo. Access1Source offers WorkforceHUBÂ, the unified Human Resources portal that makes it easy to optimize the performance of your managers, employees, and company. WorkforceHUBÂ includes TimeSource Plus, TimeSimplicity, and TimeWorks Mobile. We’ve just added onboarding, benefits enrollment, performance reviews, and employee engagement! WorkforceHUBÂ is created for busy employers like you who need to streamline scheduling, automate time and attendance tracking, maintain regulatory compliance, and reduce labor costs.